This one is so simple but I’m really excited about it. I received (yet another) giant cauliflower last week. I loved this preparation so much that I made it two nights in a row… which rarely happens around here. 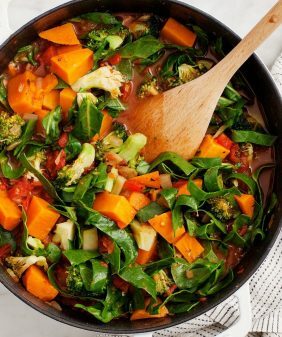 This is great as a side dish but it would also make a nice appetizer – skip the greens and serve them with the sauce for dipping. Preheat oven to 350. If you've just washed your cauliflower, pat it dry and sprinkle with salt. Let it sit and dry while your oven is preheating. Place them on a baking sheet and bake them (we're pre-cooking them) for 15 minutes, or until they're a little bit soft and barely browning on the edges. Remove from oven. Meanwhile, stir the yogurt ingredients together. Taste and adjust. Refrigerate until ready to serve. Heat a large skillet over medium heat and coat the bottom of it with olive oil. Add the garlic and then the cauliflower steaks. Cook on each side for about 5 minutes or until they're golden brown and caramelizing. (reduce heat if the garlic starts to burn). Remove them from the skillet, salt them a little bit more and serve with a few greens & pomegranate seeds (optional)... and generous dollops yogurt sauce (less optional). I keep reading “Cauliflower Steaks” on vegan restaurant menus locally and wondered what that would look like. Sounds great! Me too and was never enticed to order them. I figured they couldn’t possibly be as good as roasted cauliflower… I was proven wrong. Gotta try this when I get some fresh cauliflower at the farmers market this weekend. Goooooorgeous. Need it, want it, crave it, need it. Oh I already said that. You should be proud! This sounds amazing…and looks utterly stunning! 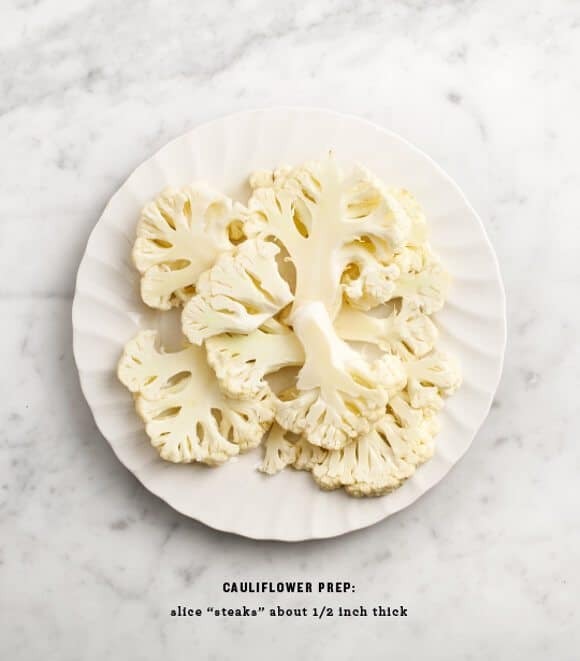 We love cauliflower – but have had problems cutting it into “steaks.” How big a cauliflower should we be looking for? Hi Ann, mine was pretty big, but a medium one would be fine. Cut from the center, and save the florets pieces from the edges (and the florets that fall off) for something else (or just roast them in the oven until golden brown). I’ve always wanted to try sumac, haven’t gotten around to it yet. Very soon, thanks for the reminder! 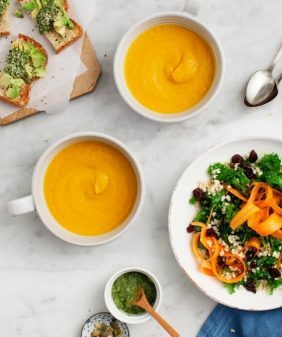 It’s a total go-to of mine, it’s so tasty and easy to whip up with things I keep on hand. 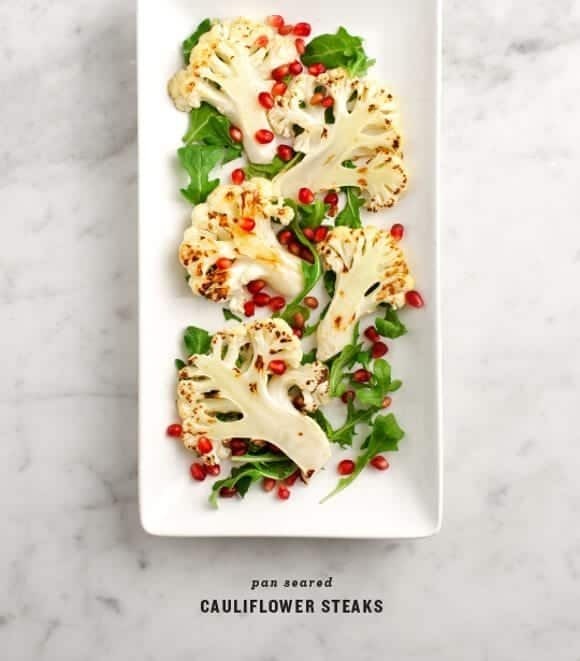 I keep seeing cauliflower steaks everywhere and I LOVE this idea! We both posted cauliflower steak recipes today:) Love it! I know, yours look so good! Gorgeous idea! Your photography is so consistently beautiful! Do you use natural lighting or daylight lamps (if you don’t mind me asking 🙂 ) ? Thanks! Most of the time we shoot at night with one soft box (continuous) light, with a clear photo bulb (not the blue daylight ones). I adjust the white balance in Lightroom to get rid of the orange cast. Of course, in a perfect world we would shoot with natural light… right now our schedules don’t allow for it, and also we really just like to eat dinner at dinner time! Thanks for the quick response! I have to large day light light bulb soft boxes but haven’t gotten the hand of positioning them yet and I just end up with weird shadows! Do you position the light/lights over head? nope, to the back right, then I hold one of these in front to diffuse it more: http://tinyurl.com/a963e3u. And Jack holds a piece of white poster board reflecting in from the front/left to counter-balance the dark shadows that happen in front. Took a lot of trial/error to get the setup just right… I’m thinking of posting about it one day because so many people ask. I would love to read that post! Your photography is so beautiful. I always feel guilty for shooting at night, but it really is the only time I have. Nice to hear that I am not the only one. 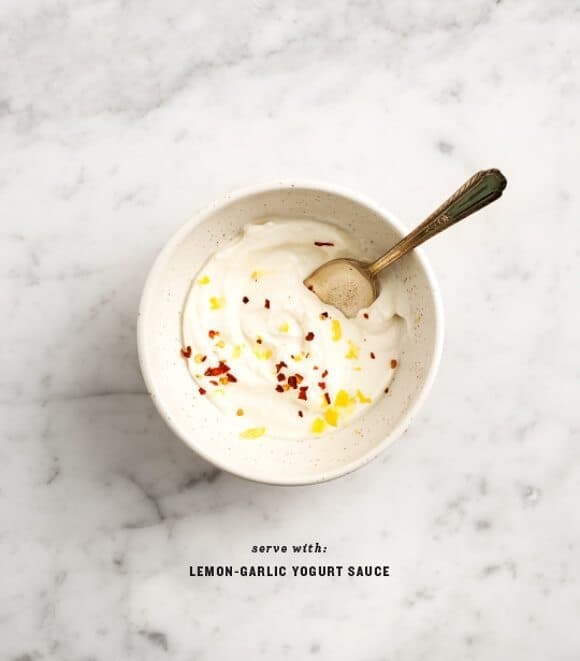 Garlic lemon yogurt sauce combines all my favorite things! I could eat it by the spoonful!!! Also, can I just say, I want your kitchen and your lovely countertops! I will be making this very soon. Looks delicious!! Wow, does this sound good! I think it’s going to end up being tomorrow nights dinner :D.
Uh, no. That’s the definition of awesome, in my book! 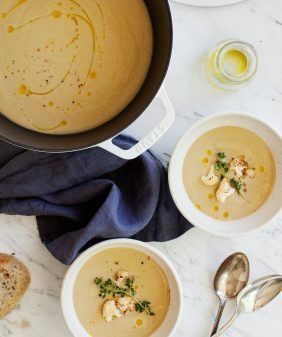 Better than roasted cauliflower? 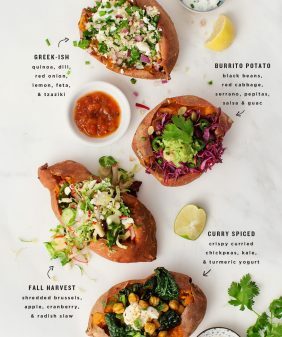 Then I must try them because roasted is pretty much the only way I can tolerate cauliflower. I liked it about the same as roasted… it gets that same golden brown caramelization on the edges so it’s sort of similar. I love cauliflower and do a lot of roasting when I make it. This garlic yogurt sauce looks wonderful for dipping. Great addition! 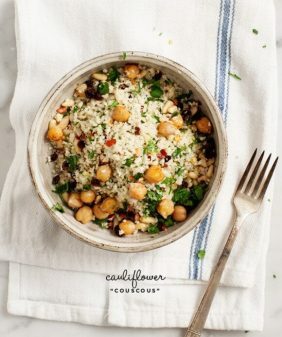 I love this recipe, cauliflower is one of my favorite vegetables and serving it with a yogurt sauce sounds healthy and satisfying! Oh man, I just made these tonight and they are to die for! Who would have thought something so simple could be so good! Another reason I love vegetarian foods. Hi Marleena, my thoughts exactly, glad you liked it! Totally loving this recipe. I’ve been on a cauliflower kick lately. Going to have to try this one! I love cauliflower! 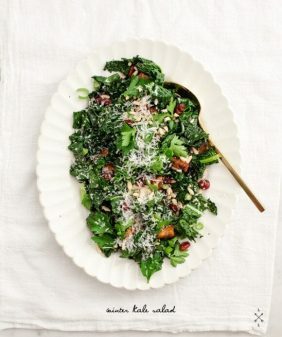 Seared is even better…gorgeous photos (Pinterest sent me your way!). Hi Laura, thanks & welcome! This is my first trip to your lovely blog! I found it from your recipe on Cup of Jo and I love it! Your photos are so nice and all the recipes seem so interesting! Thanks! “pomegranate seeds (optional)”, no way, they absolutely made it for me! Definitely sprinkle some on if you have them on hand. Thanks for an awesome lunch Jeanine.